Increase your order to $500 or more to qualify for $20.00 off on your order today! Custom Imprinted Kids Color Changing Sunglasses can make kids parties and school events fun filled. The biggest highlight of these custom sunglasses is their ability to change color when exposed to sunlight. Apart from that these custom kids’ sunglasses are provided with UV400 protection and assorted color combinations. An imprint size of 1 1/2" x 1/4" Gives your brand the utmost visibility through the event. Travel agencies as well as event organizers can utilize these sunglasses for their promotions. Order now to grab our free online proofs and free artwork design facilities. 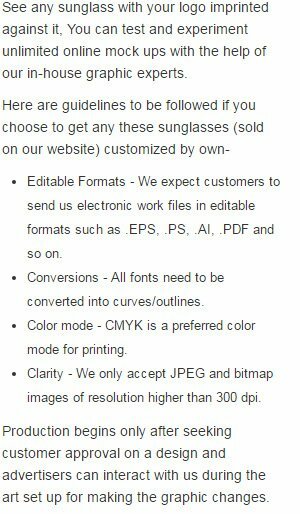 Request a quote to know wholesale savings for these Custom Imprinted Kids Color Changing Sunglasses. Product Size: Frame Width: 5"; Arm Length: 5"